For Immediate Release: Posted On 8/8/2017 By Industrial Magnetics, Inc.
Industrial Magnetics, Inc. announces the construction of a new, onsite R&D lab to perform simulated application testing of magnetic products for customer’s prospective holding, lifting, automation, conveying, and magnetic separation projects. The new 1,400 sq. ft. lab is near completion and will feature various magnetic products, specialized lifting equipment, and bulk conveying systems designed to replicate the customer’s application in the field. A sampling of the lab’s features include: a crane system with an air chain hoist for testing load weights up to a half ton, a pull-test machine with capabilities up to 15,000 pounds, gauss testing (both surface and gauss-at-a-distance) for permanent magnet materials, electromagnets, magnet assemblies and magnetic separators, and parts-per-million testing for ferrous contaminants in bulk material samples. The facility will be directed by R&D Lab Coordinator, Paul Hardy, a 20-year veteran of the company with experience in application and field sales, as well as product development. 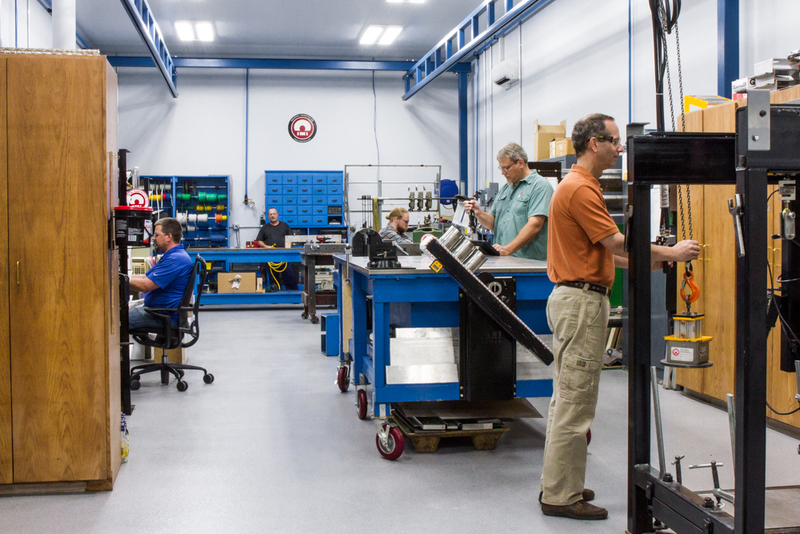 Speaking to the advantages of the new facility, he states, “Customers will have the benefit of knowing how their magnets will perform in the field prior to installation, as we can replicate their application right here in the lab. This will give them real confidence in the capabilities of their system before the magnets are built, shipped and installed”. Within the next few months, the facility will also contain an automated testing system for both pneumatic and gravity-fed systems using IMI’s products such as drawer magnets, magnetic drum separators and pneumatic line separators. This test cell will allow IMI to use customer supplied product samples to simulate bulk conveying applications for particle sized materials, granular products, pellets, etc., and test them at specified flow rates and product velocities. Data collected from the testing will aid IMI in designing and engineering the best magnetic solution to match the customer’s specific requirements for the application. Upon completion of the testing process, a full report complete with pictures, video, test results and recommendations will be provided. Most testing can be completed in 7-10 business days and customers are welcome to attend the test sessions in person or via Skype. Prospective customers who are interested in obtaining additional information or initiating a free product test should contact their IMI regional Sales Manager, or call IMI’s inside sales department at 800.662.4638.